March 14, 2016 by Ecommerce News. About Statistics with tags The Netherlands. 5423 views. 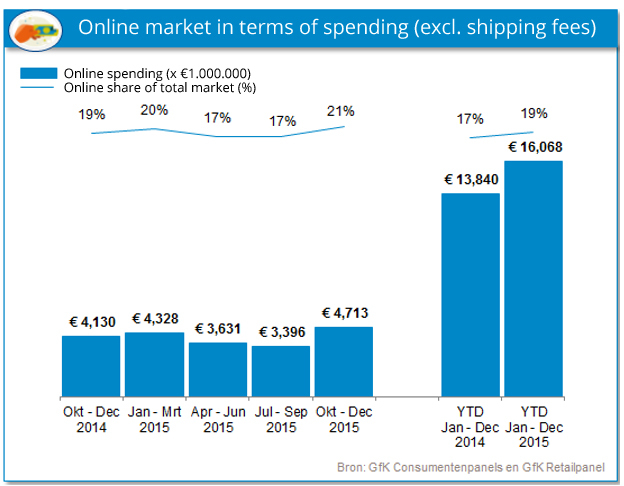 Ecommerce in the Netherlands was worth 16.07 billion euros in 2015. During that year, ecommerce sales increased by 16.1 percent compared to the year before. Also, Dutch consumers completed more than 142 million purchases online, which is an increase of 17.4 percent compared to 2014. The news was released by Thuiswinkel.org, the Dutch ecommerce association that gives insight into the local ecommerce industry every year. The growth of online retail is mostly due to an increased spending in products, like food, toys and fashion. Dutch online shoppers spent more than 8.41 billion euros on products last year, which is an increase of 21.9 percent year-on-year. The purchase of services increased as well, with 10.3 percent. “We see an unexpected strong growth of online spending on goods last year. When we compare thse purchases with total consumer spending on retail goods of 95 billion euros last year, the online share is now 8.9 percent, while it was 7.6 percent in 2014”, Thuiswinkel.org’s director Wijnand Jongen says. Especially the last quarter of 2015 showed some good results. For example, Dutch consumers spent 54 percent more online on food than they did in the same period one year before. Online shoppers in the Netherlands spent a total of 700.46 million euros on food online last year. Another notable driver of online sales during the last year, was toys. Whereas in 2014, the online share of toys was 29 percent, last year it increased to 36 percent, reaching sales worth 114.48 million euros. Another fact Thuiswinkel.org shared, (you can find the Dutch infographic here) the number of online shoppers increased by 6 percent to 11 million. In the Netherlands, there are almost 17 million inhabitants. According to the research, 48 percent of online spending happened via the laptop. The desktop accounted for 36 percent, followed by tablet (12%), smartphone (3%) and in-store (1%).